What you need to know about "Discrimination"
Discrimination is when someone treats you differently or unfairly because of something about yourself that makes you different from them or others– it may be because of your race, culture, religion, gender, sexuality, or age. If they stop you from doing something because of one of these things, then that is discrimination. People shouldn’t discriminate against you, and you have every right to feel upset about it, but you shouldn’t let them get away with it. To report discrimination is usually the best thing to do – e.g. if you’re discriminated against at school you could tell a teacher who you trust to help you be treated fairly. If you are older and trying to get a job when you feel like you are being discriminated against, then the person who interviewed you can be tested by a questionnaire under the equalities act which can help to show whether they were hiring fairly or whether there was discrimination happening. Thanks to our friends at Ditch the Label for this list. 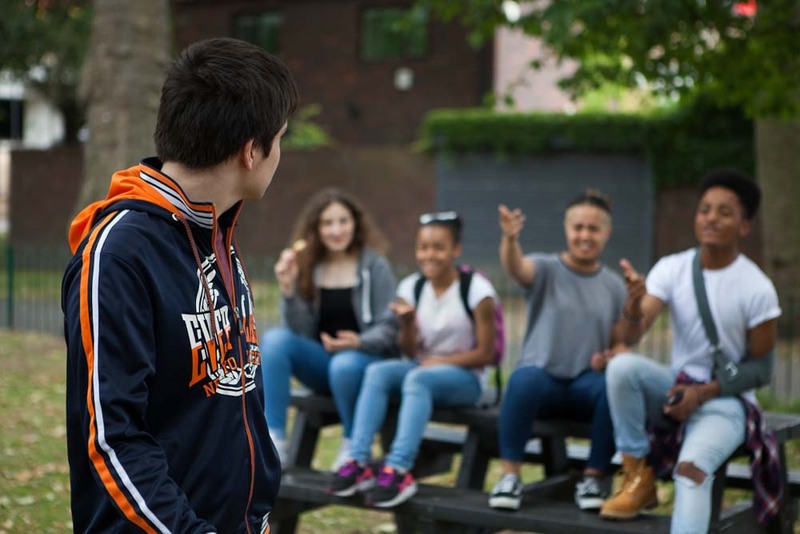 Our research found that 34% of young people reported being bullied for prejudice based reasons. Discrimination is a hate crime; it is illegal to treat someone differently because of attitudes towards unique factors such as sexual orientation, gender identity, race or ethnicity, disability, religion or beliefs. Unfortunately we can’t identify the exact reason why somebody decides to act in this manner – but we find that prejudice-based hate, is usually a learnt behaviour. After all, None of us are born with the ability to read or sing a song; nor are we born with the ability to discriminate against someone because of where they were born or the colour of their skin. People who feel the need to discriminate against others normally feel threatened or intimidated by a factor that is not well-known to them or that they have limited understanding of. Unfortunately, instead of taking the time to understand or embrace that difference, they act negatively towards the unknown. Some people find it hard to quantify whether or not they are experiencing discrimination, as everybody has a different threshold – to help clarify: people can experience discrimination in many different ways; physical attacks, verbal abuse, damage to their property, jokes, threats and cyber–bullying (this could be via email or social media). Just remember – if someone is making you feel uncomfortable, you are within your right to report it. If you feel you are being discriminated against, it can be incredibly difficult to know what steps to take next – especially if the people doing it are your peers. With this in mind we compiled 6 tips to help guide you through the process. If you are experiencing discrimination or any form of bullying and need any help or advice, or just someone to talk to – do not hesitate to reach out to Ditch the Label – we are here for you. Know that what you are experiencing is in no way your fault – you are not to blame for what is happening to you. Always remember the person bullying you is the one with the issue, not you. You are not being targeted because of your race, gender, disability or any other factor, it is because of the attitude towards this factor. The only thing that needs to change is their attitude – you are perfect as you are. If you feel it is a safe and appropriate action to take, maybe try talking to the person who is discriminating. Remember to challenge the behaviour, not the person – instead of accusing the person of being discriminatory, explain why their behaviour or words have caused you distress. For example, instead of saying ‘you’re upsetting me’, you could say ‘what you said/did upset me’. It might be appropriate to request that a teacher or responsible adult hosts a mediation between you and the person who is being discriminatory. A mediation can be scary but is often incredibly powerful; it is essentially a face-to-face conversation between you and the person bullying you in a controlled, equal environment. If this is something you are considering, read our article about how to speak to someone who is bullying you first. If you are experiencing discrimination from somebody you go to school or college with, report it to a teacher immediately. If somebody is threatening you, giving out your personal information or making you fear for your safety, contact the police or an adult immediately. Whether you experience a micro-aggression or a more blatant form of hostility, make sure you are first and foremost, aware of your safety; you are under no obligation to have to respond to this kind of behaviour and can choose to walk away at any time. However, if you feel it is appropriate to speak with them or call out their behaviour, see point 2. It is extremely stressful, and can be emotionally draining and taxing to endure prejudice of any kind. This stress can have impact on all areas of your life, such as your mental wellbeing, ability to communicate with others, performance in school, self-esteem. It is therefore incredibly important to tell somebody that you trust about what you are going through; it doesn’t even have to be an adult – it could be a friend or somebody at Ditch the Label. It is vital, during a traumatic time, that you have a support system and people who you can rely on when you are feeling low, or unable to cope. We also have a really simple exercise available on our website called Stress Reprogramming which you can do either alone or with somebody else in around 30 minutes. The exercise will help you see stress differently and hopefully help you on your journey forward. It is important during this time, that you take good care of your mental wellbeing. As well as finding a support system, you need to make sure you are looking out for yourself too. Little things like eating a balanced diet, working out, getting a good night’s sleep, relaxing and having quality time with friends and family can really improve your physical and mental health, which will in turn, reduce stress. Reductions in stress increase your clarity of vision, allowing you to clearly analyse difficult situations, which will make them much easier to deal with. If you feel you need further support, it is important to reach out to your GP, a therapist or counsellor. Do you have a true story to share about Discrimination?